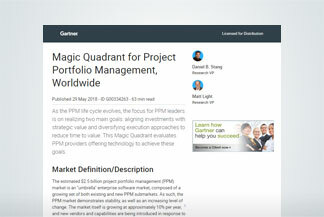 Gartner has named Planview a Leader in the May 2018 Gartner “Magic Quadrant for Project Portfolio Management, Worldwide” for its ability to execute and completeness of vision. Gartner evaluated Planview based on the company’s PPM-related products, including Planview Enterprise One, Planview PPM Pro, Planview Projectplace, and Planview LeanKit. Planview offers a work and resource management solution that fits the needs of every PMO. Planview PPM Pro is ideal for those just starting out in PPM who are looking to mature resource management and portfolio prioritization, while Planview Enterprise One goes beyond point tools for project portfolio management, enterprise architecture, and collaborative work management to orchestrate strategic execution across all work, people, and resources. Stakeholders can visualize portfolio performance against plans and make decisions that ensure they deliver the highest value projects. And, Planview Projectplace brings teams together to get the less structured, routine work done that drives much of the day-to-day business. Download the 2018 Report Today! AUSTIN, Texas, June 7, 2018 /PRNewswire/ -- Gartner has named Planview® a Leader in the May 2018 Gartner "Magic Quadrant for Project Portfolio Management, Worldwide" for its ability to execute and completeness of vision. As part of Planview's evaluation, Gartner assessed the company's project portfolio management (PPM)-related products. Planview's PPM-related products include Planview® Enterprise One, for enterprise-wide portfolio and resource management, Planview® PPM Pro, for mid-tier project portfolio management, Planview Projectplace®, for collaborative work management, and Planview LeanKit®, enterprise Kanban for engineers. "We feel this Magic Quadrant is 100 percent consistent with our perspective on the evolution of the PPM market and the need in today's enterprises for a broader approach to work and resource management (WRM)," said Patrick Tickle, Planview chief product officer. "Over the past several years, Planview has made significant organic and inorganic investments to transform our portfolio of offerings into the most comprehensive WRM solution in the market that can help every one of our customers accelerate the strategy-to-delivery aspect of their business." Planview's work and resource management solutions support all the ways organizations work. By breaking down silos, connecting teams, integrating portfolios, and providing executive level visibility enterprise-wide, Planview solutions ensure organizations can plan and scale more effectively to deliver customer value faster. In November 2017, Planview announced Planview Enterprise One – the first enterprise solution that goes beyond point tools for project portfolio management, enterprise architecture, and collaborative work management. Planview added Lean-Agile with the acquisition of LeanKit in December 2017 to help organizations orchestrate strategic execution across all work, people, and resources. And, in February 2018, Planview announced Planview PPM Pro, formerly Planview Innotas, with new capabilities to drive PPM adoption and long-term success for every PMO. Planview will showcase its work and resource management solutions at the Gartner Program & Portfolio Management Summits 2018 in London, England, June 6-7, and National Harbor, Maryland, June 12-14. Download a complimentary copy of the new Magic Quadrant report. PPM leaders should attend to learn how to scale their PPM processes, tools and functions to position their organization for success in the digital era. Pioneer new approaches, partner with teams to create a culture of change, and build bridges to get from strategy to effective execution. Planview, Planview Enterprise One, Planview PPM Pro, Planview Projectplace, Planview LeanKit are registered trademarks of Planview, Inc.
2 Gartner, Magic Quadrant for Project Portfolio Management, Worldwide, authored by Daniel B. Stang, Matt Light, published May 29, 2018.